The Aquaspace 6-way connector is perfect for pawn owners. 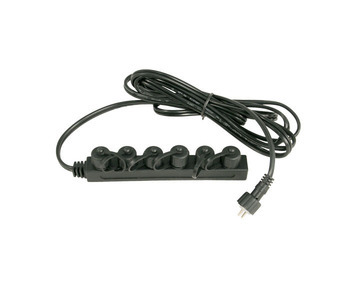 This light-weight connector provides a simple connection of 6 light fixtures to a single transformer. Easy to connect device, without the need to cut wires. Multiple 6-way quick connect adaptors can be chained together to attach additional fixtures. It includes 40" cord length, which isn’t very long but is workable if you use a single transformer as your connector. The Aquascape 6-way connector is a relatively cheap item, yet it is as low-hassle connector that you don’t have to do anything extra for to make it work for you. Pond supply store located near Los Angeles that carries pond supplies such as pond plants, pond pumps, pond filters and wide variety of aquatic plants. Sunland Water Gardens also carries the largest selection of pond fish such as Koi, Cat Fish, Tilapia and other pond fish.